Celebrate the joyful holiday of black community and culture with a bold and bright book which spells out the special meaning of each day. 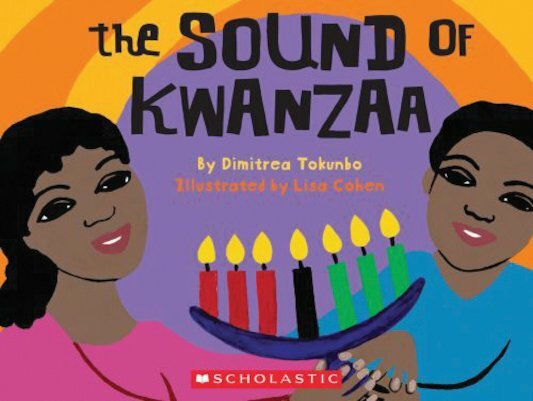 Come close, gather round, and listen to the sound of Kwanzaa! Loving words, working hands, ancient stories; banging hammers, laughing shoppers, singing voices and thankful prayers. Each page in this beautiful book shows how coloured candles are lit day by day, as the holiday moves through the seven principles of Umoja, Kujichagulia, Ujima, Ujamaa, Nia, Kuumba and Imani. At the very end of the book you’ll find a delicious brownie recipe to enjoy at your celebratory feast or party!